Decent brushes constitute the ultimate groundwork of each professional makeup. They mustn’t be bought quickly and without consideration. Poor quality brush will spoil the overall effect as it will make applying makeup more difficult. It will bring more harm than good. It is better to avoid buying cheap brushes sold in sets that are widely available in stores. 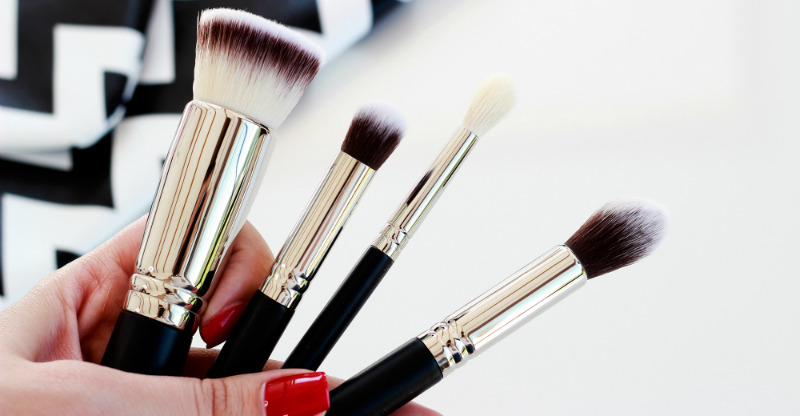 In most cases, you’ll spend much and end up using just two or three brushes only. For that very reason, we have to think for a while, which brushes are completely necessary in order to apply flawless makeup. Consider this article as a well-thought shopping list. It fact, it isn’t compulsory, yet it’s better to get one than not have any. The truth is, a foundation can be applied with hands or a beauty blender as well. This colour cosmetic has to be patted delicately, yet firmly to make it melt into skin. However, it has to be taken into consideration that beauty blenders have this tendency to gather and absorb all impurities and even regular cleansing doesn’t make the item totally hygienic. As a consequence, it has to be replaced with new beauty blender frequently. Under such circumstances, foundation brush appears to be more economical spend. Even if such an applicator seems to be more costly while purchasing, still in long run, it is cheaper since we can use it even for several years. When it comes to the shape of a foundation brush, choose only the flat ones, with dense and solid bristle (best if synthetic). Just the last thing worth mentioning, this kind of brush must be dump if we want to apply the foundation perfectly. 2. Small round fluffy brush. It’s a necessary item because of its multitask function. This kind of brush enables you to apply eyeshadows, you’ll be able to blend the shadows as well as you can use it for applying a concealer. The tip of the brush has to be of ideal shape – any individual bristle mustn’t stick out. What is more, this type of an applicator has to be fluffy. The bristle can’t be too long, because it’ll make it harder to apply colour pigments onto eyelids. 3. Small and narrow ball brush. It’s crucial for eye makeup. Thanks to this brush, you can apply the shades that require precision. Therefore, it’s useful while drawing and smudging line on upper and lower eyelids, the ones applied right on the eyelash line. This brush also works well to mark eye corners with a bright or dark shadow. The brush makes delicate and horizontal strokes. It is also important to check whether the brush is cone-shaped. Then, it will be more precise. In this case, it can be used for applying delicate lines as well as precise smudges. Moreover, the bristle can’t be too short. Otherwise, it’ll be rough and hard. It must be fluffy and dense. Its slightly cut-at-angle shape makes the brush a multitask tool. To clarify, you might use it for both contouring and applying blusher. Mind you, this kind of brush can’t be flat. Last but not least, this type of brush can’t be made of synthetic bristle because it’ll impede precise application. 5. Cut-at-angle, very flat brush. This kind of brush is designed for eyebrow makeup as well as for defining eyelash root lines. It’s just irreplaceable where absolute precision is required. Remember that the bristle must be perfectly cut and even. Moreover, this type of brush has its application for lip makeup, too. This pointy-ended side enables to outline contour of lips. When rotated flat, it helps with filing lips with a pigment. Choose a brush that is made of synthetic bristle as it’ll serve you longer. Loose powder likes powder puffs – a soft and lavish applicator of big diameter. It’s better than a brush because powder puff enables you to pat powder into complexion way easier and more precisely. This, in turn, has its consequence in makeup being long-lasting.